"In no other state in the union has any university done the same work for the community that has been done in Wisconsin by the University of Wisconsin." 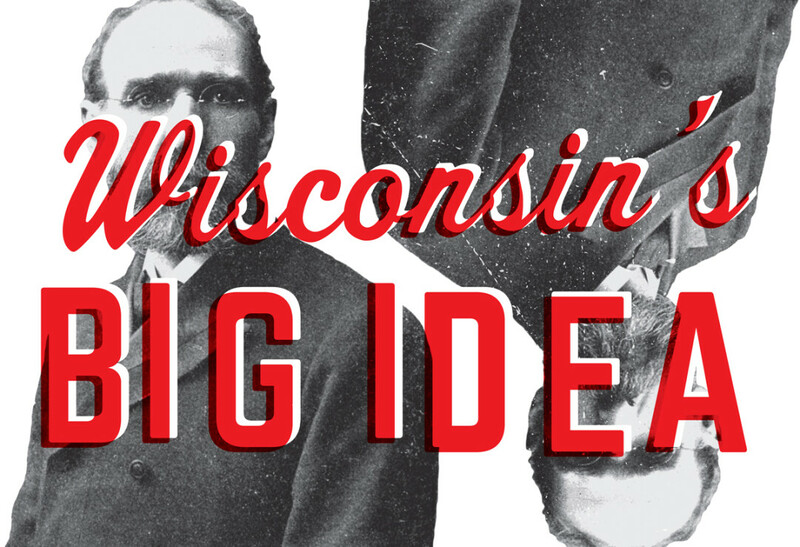 At the beginning of the last century, the Wisconsin Idea was brought up alongside its older brother, progressivism. This philosophy calls for government to exist for the benefit of its citizens. While that may seem self-evident today, prior to this movement government stayed out of the way as industry barons accumulated wealth on the backs of those citizens. Progressive politicians sought to give working folk more power to control their own destinies. 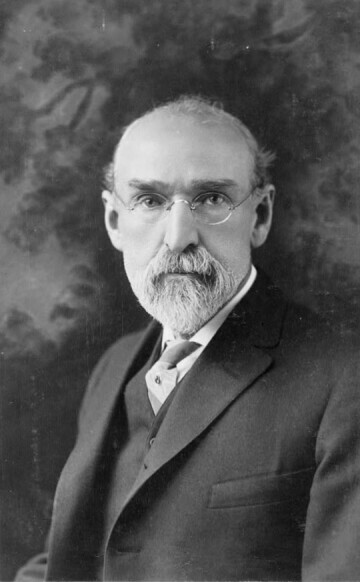 The labor, insurance, taxation, and education laws that came to be called the Wisconsin Idea were the result of these efforts. Recently, the Wisconsin Idea has made the news: In his version of the 2015-17 state budget, Gov. Scott Walker called for removing language requiring the UW System to improve the human condition and search for truth. His office backed off and claimed the changed language was a “drafting error” (although released emails demonstrate this was not the case). More recently, faculty at several UW System schools voted no confidence in the efforts of UW System President Ray Cross and the Board of Regents to protect the Wisconsin Idea. As a staff member at UW-Eau Claire, I regularly see the commitment of my colleagues to the Wisconsin Idea. I became interested in exploring how the concept tangibly impacts our lives. What follows is the result of that investigation, a very small selection of some the hundreds of projects that the UW System carries out that improve the human condition in the Chippewa Valley. Many of these projects extend their reach to residents in other parts of the state, or even other countries, but all are based here, in our home. Some search for truth, some perform a public service, some broaden the reach of the education offered in a university. All exemplify the Wisconsin Idea. UW-Extension officials and a Chippewa County farmer. Today, Extension does what it always has: putting the latest research directly in the hands of Wisconsin residents. Sandeen recalled a recent visit to a farm in the Chippewa Valley that provides Extension with some land on which to experiment on the latest research. In return for providing this service, the farmer receives advance notice on new findings. “Even though seed companies and fertilizer companies provide farmers with research, in this case this farmer trusted our research because he knows it’s objective and it’s coming from the university,” she said. 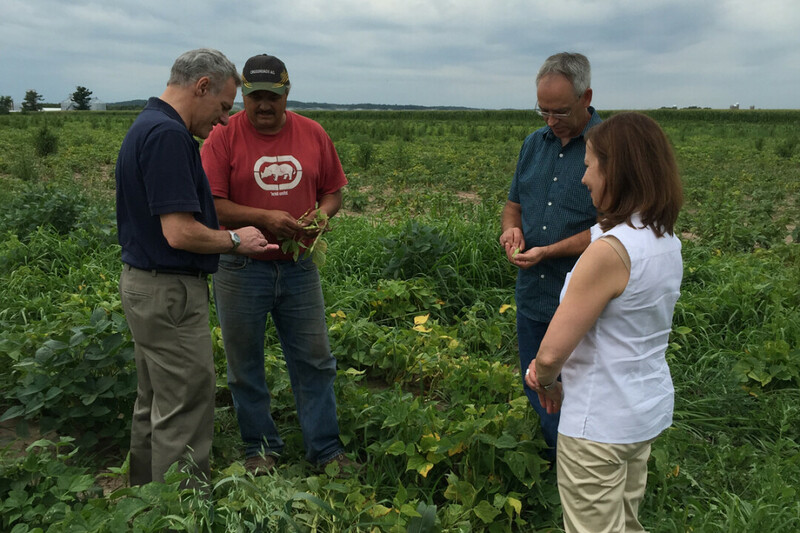 Examining the growth of cover crops used to reduce erosion at the Red Cedar Demonstration Farm in Menomonie. Credit: U.S. Department of Agriculture. Heavy rain in recent years has been washing away a farmer’s best friend: the soil. 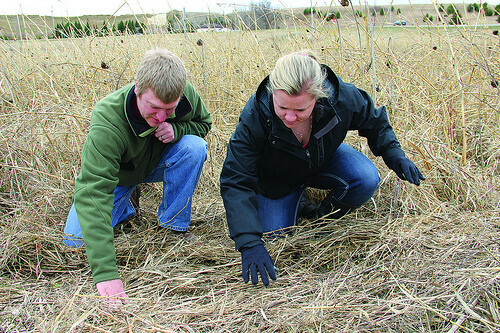 The goal of the Red Cedar Demonstration Farm, a collaboration between UW-Extension, Chippewa Valley Technical College, and Dunn County, is educate farmers on the use of cover crops and alternative tillage practices to help farmers mitigate this loss. This partnership has entered into a five-year lease on 150 acres of county and City of Menomonie-owned farmland to study soil and water erosion on farmland, with the mission of promoting better soil health and water quality best management practices. Their short term goal is simply to make farmers aware of these alternative practices. To that end, the project hosted a field day on the demonstration farm last fall, supported by a Sustainable Agriculture Research and Education grant. According to Katie Wantoch, agricultural agent with UW-Extension in Dunn County, the ultimate goal is to educate the public on these practices and have them adopted by community members and area farmers. This will happen through education and drawing on community relationships, which is how much of Extension’s work is accomplished. “I work with farmers ranging from those who are established and looking to improve practices and then turn more profit, to entrepreneurs who are just getting started,” she said. One woman, who she worked with extensively, participated in an UW-Extension educational course, developed her business plan, received her Wisconsin cheesemakers license, and has now opened her own farmstead. “We teach people in the community, and transform and improve their lives,” Wantoch explained. Studying water samples at UW-Eau Claire. Brian Mahoney, professor of geology at UW-Eau Claire, was shocked when he discovered that although the U.S. Environmental Protection Agency and the state Department of Natural Resources have regulations in place for water purity levels, there was no baseline data on the natural background levels of metals in the environment before industry, such as silica sand mining, is taken into account. In other words, there was no starting point to base analysis of future data on. It would be like determining how much faster a sprinter has gotten in a year without knowing how fast she was to begin with. Soil, rock, and water samples are analyzed to determine metal content. Then the process used by the sand mining companies is evaluated to determine what effect it would have on the water. The results can be used by the DNR to develop reasonable regulations. For example, six months into the project Mahoney has discovered there is very little chromium in our waters. Since sand mining does not use chromium, and the bedrock where they are working does not contain high amounts of chromium, sand mining is unlikely to add chromium to the water. At the moment, the DNR requires companies to frequently test for chromium, but since chromium does not seem to be a problem with sand mining, the DNR may want to alter its regulations to focus on other metals of more concern. Every year, two dozen North Americans with aphasia and their partners travel to beautiful Camp Manitou outside New Auburn to attend a unique camp. 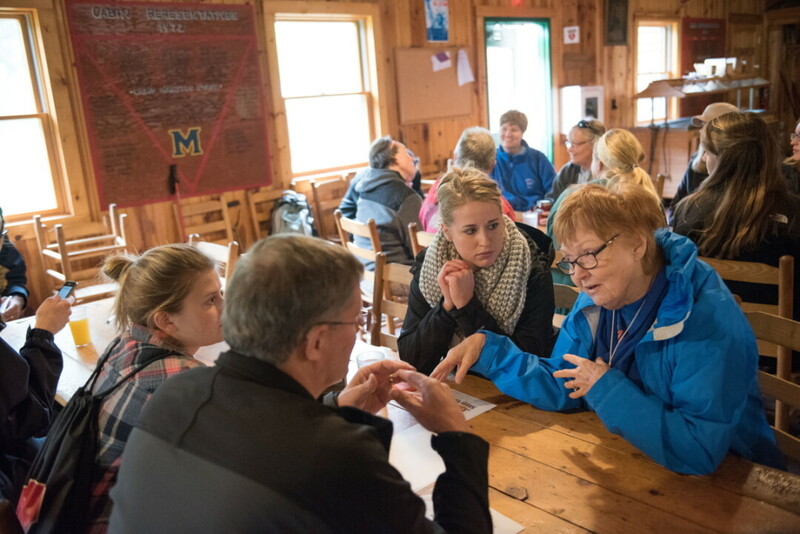 Founded in 2004 by speech-language pathologists at Mayo Clinic Health System Eau Claire and UWEC, the Chippewa Valley Aphasia Camp helps alleviate social isolation and reduced social networks that occur as a result of aphasia. Aphasia is a neurogenic condition, typically the result of stroke or head injury. While areas of the brain responsible for speaking, understanding, reading and/or writing are affected, cognition and thinking remains fully intact. Those with aphasia know what they want to say, but can’t say it. Camp director Mary Beth Clark, Michele Knutson, and Carin Keyes are speech-language pathologists at Mayo Clinic Health System Eau Claire and facilitate the camp together with Jerry Hoepner and Tom Sather from UWEC’s Communication Sciences and Disorders Department. These staffers, along with community volunteers and 25 UWEC students (from communication sciences and disorders and other majors), join the campers for the entire weekend. Campers enjoy social activities such as hiking, golf, and woodworking, and form relationships with the other campers and those working at the camp. The goal is for the aphasia to become transparent. 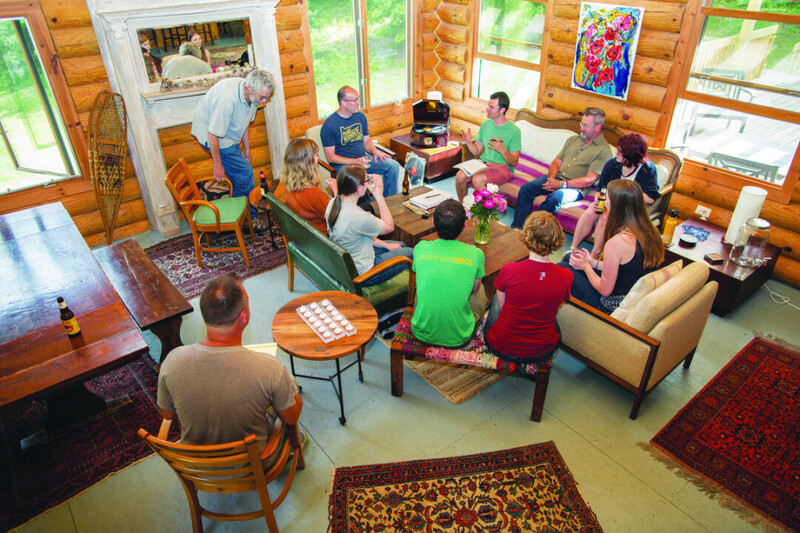 A writer's retreat at the Cirenaica lodge hosted by the Chippewa Valley Writer's Guild. One humid weekend in July, I ran away to the countryside to attend a Chippewa Valley Writers Guild residency at Cirenaica, a serene artists’ retreat in Fall Creek. Despite a case of introversion, I felt at home in this group as I worked on several projects, received feedback on others, and learned from John Hildebrand, a master of the craft. Founded by B.J. Hollars, an author and associate professor of English at UWEC, the guild’s goal is to foster that very feeling of kinship and inspiration by drawing writers out of their isolation. “As a community, I know we’re stronger when we support one another,” Hollars explained. “The guild is my humble effort to support the writers of this region.” These residencies are only one part of Hollar’s grand plan: The guild offers free craft talks and a newsletter thanks to funding from the UWEC Foundation and the Eau Claire Regional Arts Council. Just one of many performances hosted around downtown Eau Claire and beyond during UW-Eau Claire's annual Jazz Fest. One night in late April, my husband and I strolled down Barstow Street, wondering decide whether to listen to classic swing jazz at the Lismore or more contemporary tunes at the Mousetrap, which was packed to the gills with an enthusiastic audience. We ended up wandering into the Micon Downtown Cinema, which hosted a large group of high school musicians who spent an hour improvising on stage with surprising confidence and skill. Any of those kids could become a world-class musician. Now in its fifth decade, the Eau Claire Jazz Festival has spilled out from beyond the borders of UWEC, where it began as the Wisconsin State University Jazz Festival, which was meant to provide educational and cultural enrichment for jazz musicians. Fifty years ago, jazz was still an emerging art form that was being worked into school curriculums, said UWEC’s Bob Baca, the festival’s artistic director. “The new jazz festival provided university and high school students with high-level concerts … and instructional clinics to carry the flag and propagate America’s only original art form into Wisconsin schools,” he said. In 2009, Baca wanted to reach further out into the community and renamed the event the Eau Claire Jazz Festival. Although it still focuses on educating, entertaining, and promoting jazz, it now does so in the wider community rather than within UW-Eau Claire’s walls. The wider community benefits from the event in more ways than just the cultural. 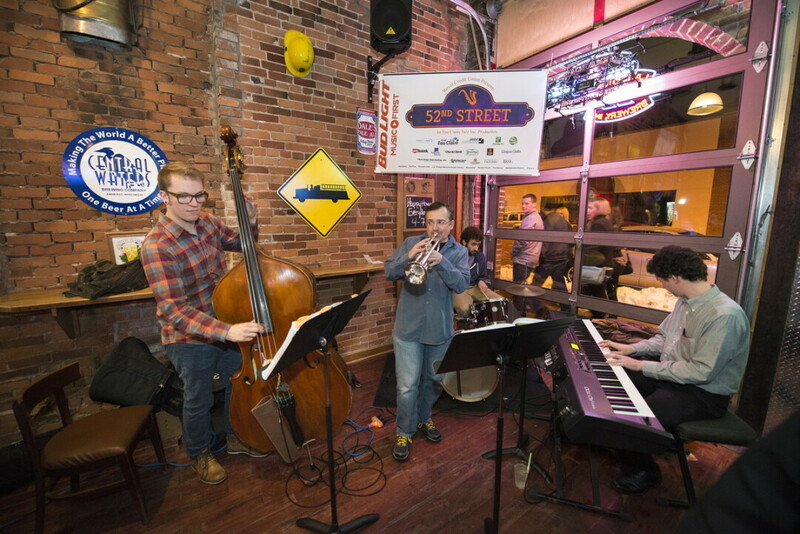 Visit Eau Claire, the region’s tourism promotion agency, estimates that the 2016 Jazz Fest brought $267,750 to the city, including the money spent by an estimated 6,500 spectators and 300 overnight stays. “Today, because of the partnership between UW-Eau Claire and the community-based business machine of Eau Claire Jazz Inc., the Jazz Festival has expanded its commitment to educate, entertain, and inspire all who attend, and as a result of our university and community working together has become one of the nation’s largest jazz festivals,” Baca said. 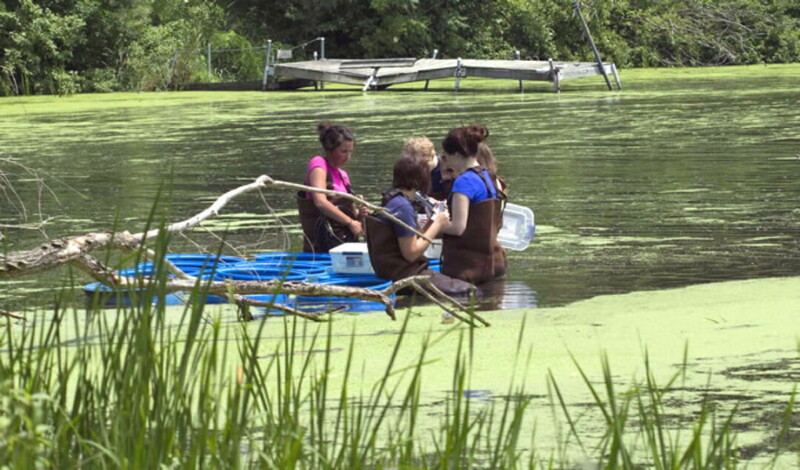 Studying blue-green algae in Lake Menomin. Summer is a special time of year in Wisconsin, a time to enjoy nature’s beauty, to hike, and to get on, in, or by our beautiful rivers and lakes. Unless that lake is Lake Menomin and the time is August. Lake Menomin has a phosphorus problem; blue-green algae bloom every summer, turning the lake toxic. 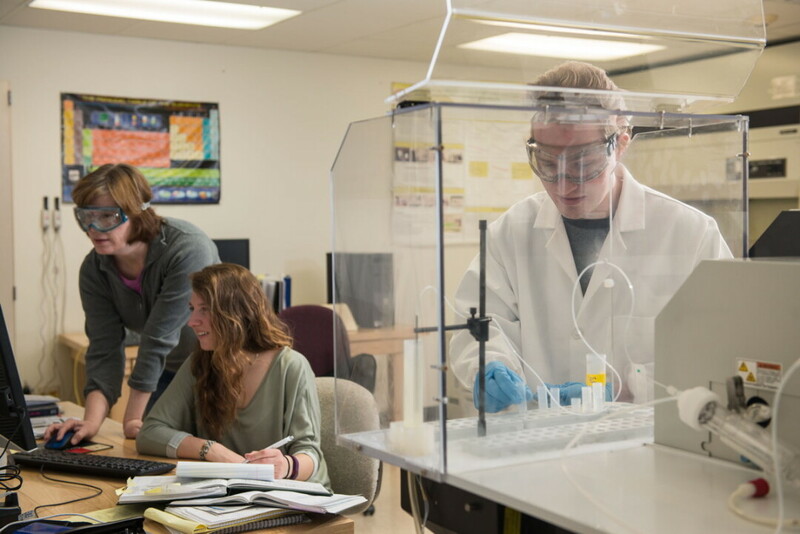 The Linking Applied Knowledge in Environmental Sustainability Research Experience for Undergraduates (LAKES REU) grant is administered by a cross-disciplinary team of professors at UW-Stout. (Full disclosure: My husband, Chris Ferguson, is co-director of this project, but I still think it’s interesting to people not married to him.) The project is funded by the National Science Foundation for three years. Students studying biology, economics, sociology, geology, anthropology, mathematics, and geography spend two months in Menonomie mentoring under a number of UW-Stout professors to study the issues behind the phosphorous pollution and to explore possible solutions. Last year, the project determined the lake’s pollution problem is costing the county $36.6 million in lost tourism, a figure that got the project some attention. Wisconsin’s DNR and the U.S. Army Corp of Engineers have been so impressed with the project that they’re funding an expansion of the same work to study the entire Red Cedar watershed. Nels Paulson, co-director of the LAKES REU (not the one I’m married to) and a associate professor of sociology at UW-Stout, believes this project wouldn’t exist without the Wisconsin Idea, which helps to determine research priorities for the long-term benefit of the state.